Birds, reptiles, amphibians, arachnids and insects are all important and effective predators of grasshoppers and their kin. To protect themselves from these predators, grasshoppers use a number of adaptations, including locomotor escape, crypsis and toxins. While most species are green to camouflage with their habitats, others wear bright colors to warn predators of their noxious chemicals. 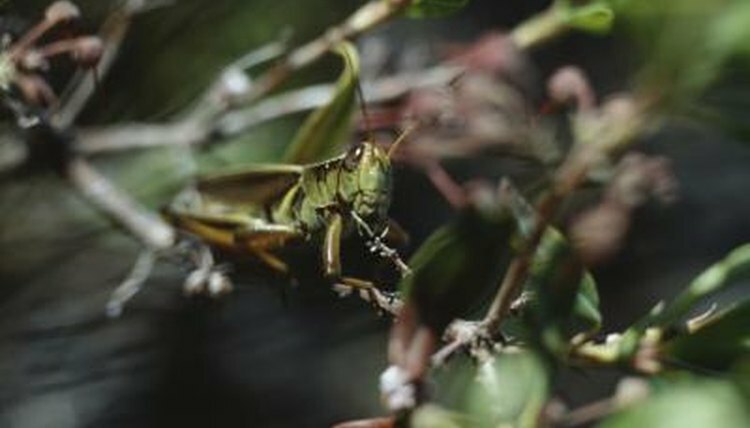 Grasshoppers are leaf-eating herbivores -- foliovores -- who consume a wide variety of plant species. Females lay about 100 eggs per season; they deposit the eggs in small depressions in the soil. After depositing the eggs, the females surround them with a frothy mixture that hardens protectively over the pods. Grasshoppers exhibit incomplete metamorphosis; the young hatch from their eggs as nymphs, which look somewhat similar to the adults. Unlike many insects that live in secluded places or have nocturnal habits; grasshoppers are diurnal and spend a lot of time in exposed places like meadows, lawns and grasslands. Many grasshoppers feature a mix of green and brown colors to help them camouflage amid the plants, grass and weeds on which they live. Some species exhibit different colors in different portions of their geographic range to blend more effectively with the local vegetation. To further their cryptic efforts, grasshoppers freeze and remain motionless when they see a predator. If the predator gets too close, the grasshoppers will try to jump or fly to safety. Grasshoppers have many predators, including birds, small mammals, lizards, frogs snakes spiders, wasps, robber flies and praying mantises. Many grasshoppers change their color over time. The nymphs of many species change color with each successive molt, which may be in response to shifts in microhabitat preference. Other species change colors as their food sources change. In 1953, Salahattin Okay of the University of Ankara found that some species changed from green to brown as the humidity level drops. Okay demonstrated that the brown individuals of the species in his study were missing the blue component of their green pigment -- eliminating the green color entirely. Not all grasshoppers are green. Some -- for example luber grasshoppers (Romalea microptera) -- display bold colors including red, yellow and black. These colors serve as a warning to potential predators that these grasshoppers possess and emit noxious chemicals when threatened. Often, these boldly colored grasshoppers raise their wings, flail their legs and hiss by forcing air through their breathing tubes. The toxins emitted by these grasshoppers can make birds and opossums very ill.